Its back and bigger than ever! Shark week 2016 was huge success for the SDX team as we where featured once more for the latest instalment of the “Serial Killer” franchise. This is now the 3rd collaboration with Jeff Kurr and the Discovery team on this particular mini series for Jimi and the team. Showcasing a specialised behaviour and getting closer than ever…….”Great White serial killer lives” was another fascinating story and rounded the series off in style. Starting with the original “Great White serial killer” and exploring the mysteries surrounding shark attacks taking place along the Californian coastline every two years, discovery channel and Jeff Kurr have now collaborated with SDX on 3 of the 4 parts to the series. Our teams’ partnership began with part 2 of the series – “Return of the Great White serial killer” which saw Brandon McMillan and Jimi Partington diving with two of Guadalupe islands’ biggest and best – The famous “Lucy” and the fiery “Emma”. 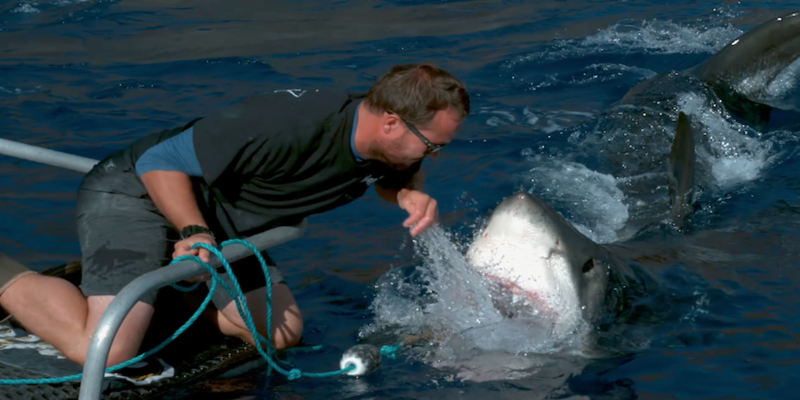 In 2015 SDX was once again used to complete filming of a segment used in part 3 – ‘Wrath of a Great White Serial killer” when we used the “bite board” to collect bite signatures from some of our sharks. Now, to complete the series, we headed out to the island again last December to film the most dramatic sequence yet…….. The 4th and final entry to the series, “Great White serial killer lives”, again hosted by Brandon McMillan concludes the story and along the way paired up Brandon with Jimi of SDX for a very close encounter. We filmed some amazing breaches on the baits as Jimi worked the sharks around the boat and cameraman Andy Casagrande was on hand to capture some of the animals high lunges in amazing high definition. The highlight of the sequence was when Jimi showed Brandon a discovered behaviour with the sharks. By gently touching the sharks on the snout area the sharks responded by gaping and on one occasion, Jimi came very close to having his hand down the throat of one particularly excitable shark! Filming of this sequence took place over three days at sea and it was far from an easy one to capture. On the first day the sharks where on excellent form and we got a lot of what we wanted in the can. Day two however saw the shark behaviour completely change and they where simply just not “in the mood”….all the pressure was on the third and final day! It took till around midday on the last afternoon before the sharks started to warm up again and this allowed us a small window of time for Jimi to showcase the behaviour. Not an easy thing to achieve at the best of times, with little time left the task was even more demanding to pull off! With expertise, patience and one or two particular individual sharks, Jimi and the team managed to get the shot and wrap up not only the shoot but also the 2016 season in style! Shark week is always a big time of the year for our team as it raises so much awareness for the species. The science featured in the show has also helped us and the public gain a deeper understanding of shark behaviour. The more we learn, the more we can help protect the sharks and educate the public. Jeff Kurr has created a beautifully produced, real life drama with cutting edge science and modern film making. It was a pleasure being part of it. Already we have a future production scheduled to be filmed this coming December due to be televised on shark week 2018 so watch this space and keep following discovery and SDX for future episodes.